Production at the Ricoh UK plant in Telford will have fast and direct access via Omron’s NJ-series machine automation controller to a new plant-wide database which Senior Engineer Richard Aston and his team have spent a year compiling. “I have been developing and proving an NJ controller on-site over the past 12 months or so, to the point where it’s ready to deploy,” says Richard. 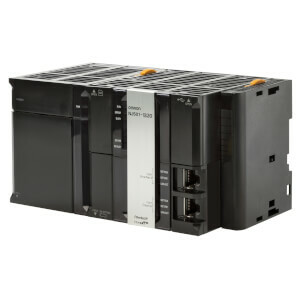 Up to now, individual PLCs on Ricoh’s production lines have had to be individually, and laboriously, updated with new product information. But in the future, code readers and vision systems will be able not only to check individual components against set product recipes in the database, but also actively update that database with fresh information, saving tens of thousands of pounds and months of development. Manufacturing on average 15,000 cartridges per month, there are 12 different variants – including shape and colour – for the toner cartridges used with Ricoh’s ProTM LP5100S range of printers. The component parts for each cartridge are shipped from Japan with QR codes to identify both the unique serial number and part number. They must also be matched with the correct colour and formulation of toner. Ricoh’s first application of the NJ controller is at this stage of the line. The process begins with the company’s Demand Chain Management department issuing a production schedule. “The aim is that the scanned-in datasheet will allow the NJ to access the database, set the active run recipe and ensure that only valid child parts for that particular cartridge are issued to line”, says Richard. Currently, the average time taken to select a recipe is 30 seconds, but with the new system it will be instantaneous and will also remove the possibility of selecting and running the wrong product. “Ultimately, the plan is to be able to manage the machine completely remotely, without the need for a physical datasheet and without the production team needing to intervene,” he says. 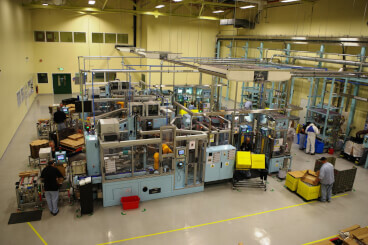 The second application of NJ controller technology is planned for the opposite end of the product lifecycle, once used cartridges are returned to the plant for refilling. Based on the data accessed, the controller makes what amounts to a split-second decision as to whether the cartridge should progress to refilling or be rejected. 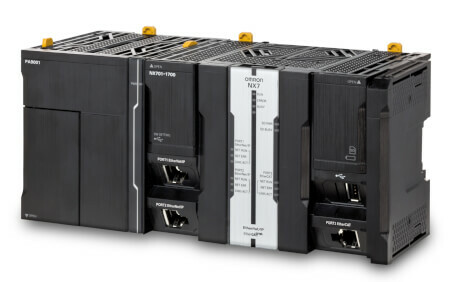 This application demonstrates the huge potential of the latest-generation NJ Series machine controllers, in this and other manufacturing settings. Even at high line speeds, it allows what is effectively localised, item-level decision-making and data-gathering through instant, two-way interaction with factory-wide or enterprise-level databases and management systems, making the systems far more flexible, reconfigurable and resilient to disruptions or changes in the process. 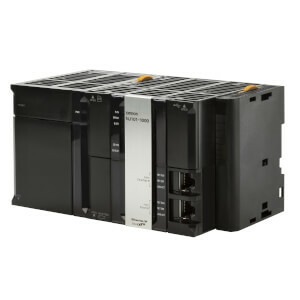 As well as the advantages of controller-to-database communications and the fact that individual PLCs no longer have to be configured, the NJ offers further benefits of compact and simplified design. As a multi-tasking controller, for example, it has integrated controls over safety and motion control functions, rather than requiring multiple, separate systems. 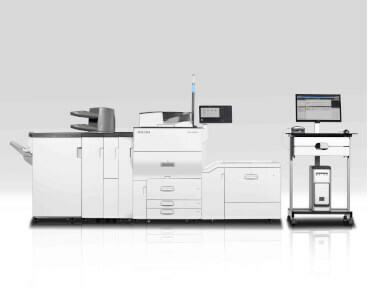 If communication between the NJ and the Ricoh UK database proves as efficient as trials have suggested it will be, the company says it can envisage similar configurations working on other product lines beyond Ricoh’s ProTM LP5100S range of printers. When it comes to operating the system, Richard says his current preference for a human-machine interface (HMI) is Omron’s new NA-series. Previously, Ricoh UK has installed several NS HMIs. But, as Richard explains, “The NA incorporates capabilities for rich media, including photos, videos and PDFs, giving operators increased clarity and control over the machinery and processes, particularly with respect to troubleshooting and maintenance."